Katie Ballard with her son Sam Ballard, who was left severely disabled after contracting meningitis and now requires 24/7 care. 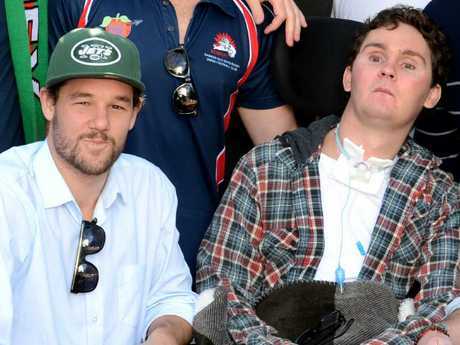 SAM Ballard, who has been profoundly disabled since swallowing a garden slug at a party as a dare at 19, has an amazing support group of family and friends. 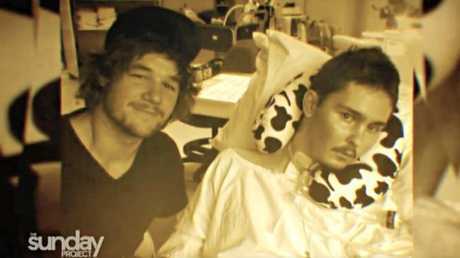 Sam, who became a quadriplegic and has to be tube fed after contracting rat lungworm from the backyard slug, has had a support group of friends since the 2010 tragedy occurred. His mates Jimmy Galvin and Michael Sheasby appeared on Sunday Project alongside Sam and his mum Katie on Sunday evening to discuss the 28-year-old's moving account of how his life has changed as a result of his decision that night. "We were sitting over here having a bit of a red wine appreciation night, trying to act as grown up and a slug came crawling across here. "The conversation came up, should I eat it? Off Sam went. Bang. That's how it happened," Mr Galvin said. I wish I could blame the tears I am shedding on pregnancy hormones but it's this amazing story on @theprojecttv 😭😭 such an amazing man with beautiful family and friends. As previously reported by news.com.au, Sam was a strapping, fun-loving rugby player when he went to a mate's party eight years ago. A group of young friends was sitting around a table drinking red wine when a slug was produced and one of them said to Sam: "Eat it, I dare you". Prior to this, Ballard's mother Katie had thought of her son as a "larrikin" but "invincible", that nothing could ever happen to him. She described him as "my rough-and-tumble Sam". At Barker College, in Sydney's northern suburbs where he went to school, fellow students thought of Sam as a beautiful, outgoing kid, sporty, a star of drama, kind and that the girls loved him. But the teenager's life was to take a devastating turn. Sam, from Sydney's north shore, fell ill from the slug dare and was taken to Royal North Shore Hospital where he was diagnosed as having been infected with rat lungworm. The worm is found in rodents, but snails or slugs can become infected when they eat the faeces of rats which carry the parasite, known as Angiostrongylus cantonensis. 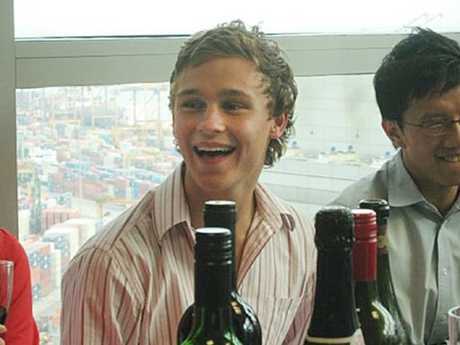 Sam Ballard was a cheeky ‘larrikin’ before the devastating effects of the infection from a garden slug. While most people develop no symptoms, very rarely it causes an infection of the brain. 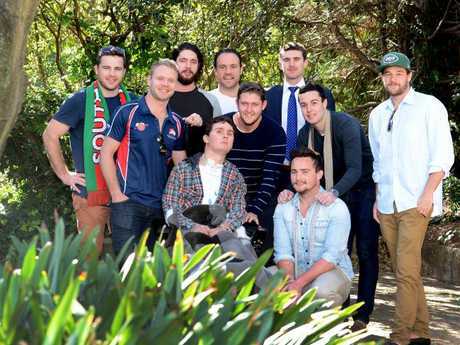 Sam Ballard with mates including Jimmy Galvin (left) at the Royal Rehabilitation Centre in Sydney before his release. Picture: Simon Cocksedge. Sam contracted eosinophilic meningo-encephalitis, from which many people recover - and, initially at least, Sam seemed to be rallying. But then he lapsed into a coma for 420 days and became a quadriplegic. Sam's mother maintained a positive attitude and in late November 2011, posted her hopes on Facebook that Sam would "walk and talk again" and that he still had the same cheeky attitude. But as Katie Ballard would later say of her son's life: "It's devastated, changed his life forever, changed my life forever. It's huge. The impact is huge." When he was released from hospital in a motorised wheelchair three years after becoming ill, Sam had his mates rallying around him. Sam, his family and friends have suffered abuse from online trolls. "(They'd say things like) The boys should be the ones paying for Sam to be looked after," Katie said. "How stupid that a kid does something like that and expects everybody to pay for it. It's tough to fathom that there are people that can't understand there is a very sick kid who has lost everything health-wise. His family have lost him, you know. And all the great times they should have had with him." Lisa Wilkinson told Mr Galvin, "Just because you were being mates and doing things together, it's not your fault. I know Katy doesn't blame you at all?" "I do know that, which is comforting," Mr Galvin said. "I have spoken with Katie about that and that's the least of my worries, I only care about Sam and his family and what we do in this situation, what we are doing in the future. My feelings are irrelevant to be honest." "Just take care of your mates. Before you jump off a roof into pool or daring your mate to eat something stupid. It can have the worse consequences not only on your mate and the rest of your friends, the rest of your life, just take care of each other," he said. But the Sam of old is still there, his mates say. Another mate, Michael Sheasby said, "Seeing where he is now, being able to move his arms or just grip something, that to me is a huge improvement. The walking into the room and a hands coming out to give you a handshake. It's that kind of stuff." Jimmy Galvin said, "We like to sit down and watch the footy and watch the rugby. I try and make it matey and fun - we will crack a beer, when Katie goes out of the room, he reaches for it, he gets his lips out and sometimes we put a little bit of beer on his lips." Interviewer Lisa Wilkinson asked, "Can you still see your mate Sam in there?" "His eyes light up," Mr Galvin said. "They go bang when you walk into the room. I apologised to Sam about everything that happened that night in the backyard. He just started crying his eyes out." Sam Ballard with friends (from left) James Harris, Alex Carolan, Tim Pasternatsky, Guy Lancaster, Sam Jenkins, Nick Dunn, Billy Dent, Jimmy Galvin and (front), Saxon Phipps. "Team Ballard" raised money for the 24/7 care that the young man would require, but it could never be enough. 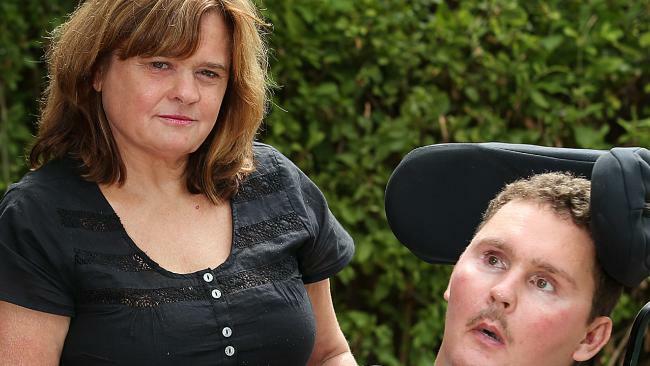 Katie Ballard with her son Sam who was left severely disabled after swallowing a slug and had his NDIS package slashed. 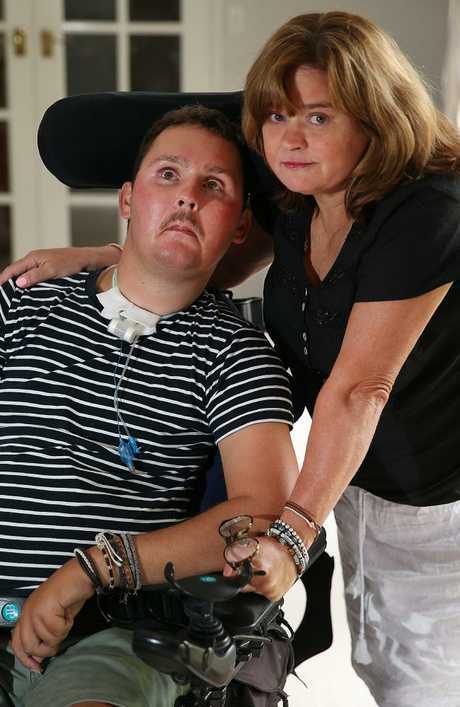 Now aged 28, Sam suffers seizures and cannot control his body temperature, the Daily Telegraph reported. He has to be tube fed. Katie Ballard applied to the National Disability Insurance Scheme (NDIS) when Sam became eligible for a $492,000 package in 2016. But last September without warning, the NDIS texted Ms Ballard to say a review of his plan had slashed his allocation to around $135,000. The massive funding cut was without explanation and around-the-clock care means the Ballard family are heavily in debt. They owe a nursing service $42,000. The NDIS told The Daily Telegraph it had been "working closely with the Ballard family" to find a resolution and increase Sam's support package. 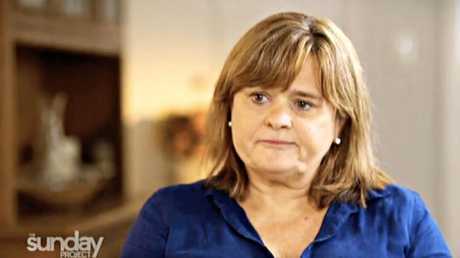 A spokesperson for the National Disability Insurance Agency confirmed Sam's plan had been adjusted back to the original level of funding, blaming the reduction by more than two-thirds was the result of an error not a policy change, The Project was told. 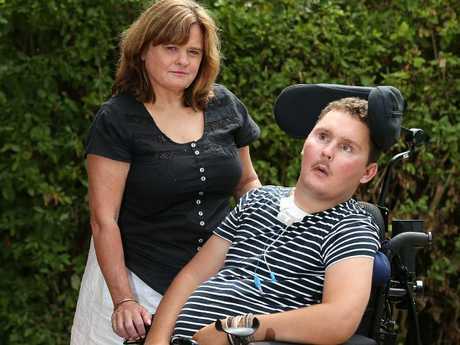 Sam (above, with mother Katie) now needs 24/7 care and his family are in debt after the NDIS slashed funding.